Views! Views! Views! 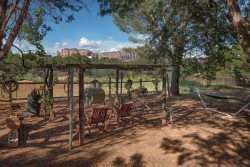 Breath-taking Panoramic Views of Sedona's Red Rocks can be seen from everywhere on this Beautiful Property! This exquisite home defines sophistication, charm and tasteful comfort. Sits on 5.3 acres in West Sedona high in elevation and borders National Forest Service Land. Located in a gated area for privacy. Well appointed with quality dishes, cookware and linens. The furnishings are elegant, stylish and contemporary. A long list of amenities that include; double negative edge pool/hot tub/ waterfall, five bedroom suites, all with double vanities, walk in closets and fireplaces, movie theater, two car garage and a game room with ping pong table, shuffle board and poker table! Chefs kitchen with Sub Zero/ Viking/Dacor appliances. This spacious Home is ideal for entertaining friends, family and business associates! Ideally located for privacy, but is also a short drive to all the uptown galleries, shops, restaurants and hiking trails. Once you are here you will never want to leave! There is an additional charge to heat the pool, please contact the office for the pricing. Entertainment: Theater Room, Blu Ray, 7 flat screen TV's, Game Room w/shuffle board, ping pong table, card table. Sky Dancer is a fantastic property with views that are unmatched. Whenever I called the staff, they responded immediately. Anthony was particularly responsive to issues at home. Staff were also very helpful. Beautiful home. Magnificent views. Our group has rented several properties across country and all nine of us commented that this home and Sedona was our favorite. Learned all about javelinas. Amazing and well maintained property. Really friendly staff. Will be in touch with foot hills property again for suuure! The Skydancer was the most amazing place I have every stayed in! The location and the view were the best and the pool was deep, so that's really nice. Agent was easy to work with and answered all of our questions promptly. The house was amazing! Incredible views, perfectly located in Sedona! There were a few minor maintenance issues that need addressing (spa not heating;foggy windows) but overall a fantastic house for a large group of people. We will be renting this property again! Everyone is professional and knowledgeable of the property. We enjoyed our family reunion at the Sky Dancer Property, it is a beautiful home, with a breathtaking view. Called maintenance and they were at the house within an hour to fix the problem. Very friendly staff. Had a great time!! Beautiful property with beautiful views. Will definitely stay there again. The property/house is incredible. The views from the home are spectacular however, several windows have lost their seal and need to be replaced. This creates issues when looking at the views through a few foggy windows. The pond area in front of the house has stagnant water in it and is not very appealing. I think the pond either needs to be maintained or drained. Sky Dancer was a truly beautiful property that will exceed your expectations. The view is breathtaking and surreal. It lives up to every photograph and more. Every detail within he home is beautiful and elegant. We stayed there with our immediate family for our wedding on the red rocks and could not have been happier. You would be crazy to stay at a hotel as opposed to staying with a few friends at this property. I recommend this property unconditionally. The most amazing house I have EVER stayed in!!! Unbelievable views, amenities etc. Perfect place for a family vacation or to host an event. Pool/Spa: Pool is not heated. If requested, there is a non-refundable heating fee. This fee starts at $1000 per week or less. In addition, if heating the pool exceeds the utility cap, tenant will be responsible for the excess propane cost.